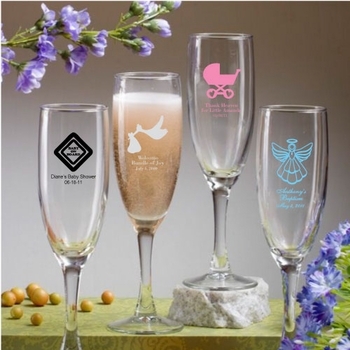 Toast your family and friends with our personalized champagne flutes. They have many personalization options available for any occasion, such as baby showers, weddings, and birthdays. By designing and selecting your own colors and graphics, you'll be sure to create a one of a kind favor! Each flute measures 7 3/4 inches tall by 2 1/4 inches in diameter. It has a 5.75 ounce capacity in the traditional flute shape complete with a long straight stem. Crafted from clear glass, these flutes are made in the USA. Minimum order is 30. Free shipping included. Gift boxes are also available for $.65 each. Click the More Images tab above to see a photo of the optional gift box. Please note: Screen printed glassware cannot be replaced if damaged in transit. A credit will be issued for any broken pieces. Just click the "Click Here to Design Your Glasses" button to the right of the item photo to open the custom designer. After you create your design, simply click the "Submit" button which will automatically fill your design choices into the boxes on the right. Please read the description under the photo before designing your glasses.